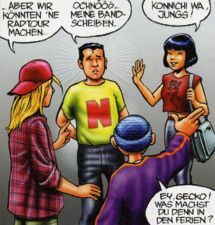 N-Gang was a comic series published in the 1999 and 2000 issues of the German Club Nintendo magazine. N-Gang is also the name of a group of teenagers, all being Nintendo fans (hence the gang's name) who featured in these comics as the protagonists. While most of the previous Club Nintendo comics centered on characters from the Mario franchise, in N-Gang their roles were mostly minor. Also unlike previous comics published in Club Nintendo, the N-Gang comics were produced in Germany rather than Japan. The setting of N-Gang is Earth. 3.2.7 Das Ende der Welt? From left to right: Toni, Nick, Big B., and Gecko. The N-Gang series centers on a group of five teenagers. It is heavily implied that the term "N-Gang" refers to this group, though this is never explicitly stated. Nick is a tall boy with curly black hair and a short beard as his trademark. He is wearing a yellow T-shirt with a big red "N" printed on it. He has appeared in every comic but two, making him the most regularly appearing characters in the series along with Toni. Toni presumably is Nick's best friend since both are often seen together. His trademark is his long blond hair and a red cap. He is also wearing a plaid jacket and short trousers. Big B., actually called Benno and often referred to as simply "B. ", is the shortest member of the N-Gang. He is seen wearing a black cap, a purple sweater and wide trousers, all in all a very hip hop-orientated style. Big B. appears to be a very careless boy who often takes action without listening to what his friends are advising. He first appeared in the story "Kino & Ketchup". Though mentioned by his friends several times before, VIP wasn't actually seen until the comic "Gecko." He is a handicapped boy with black hair and square glasses. VIP is able to bring video game characters to life, implying that he is a very intelligent boy. Gecko, debuting in the comic of the same name, is the only girl in the gang. She has skills in martial arts and uses them several times to help her friends. Gecko is wearing a red shirt with a gecko on it and black trousers. Robi, Pelle and Bernd tease the N-Gang several times in the series (though it is Big B. who provokes them first). They appear as rather dumb and revengeful boys who steal Nick's Game Boy Color, for example. Usually it is Gecko who drives them back. 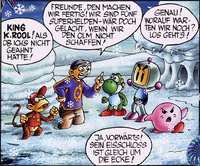 The last panel of "Freeze Frame," depicting many of the Super Mario standard and cross-over characters appearing in N-Gang. 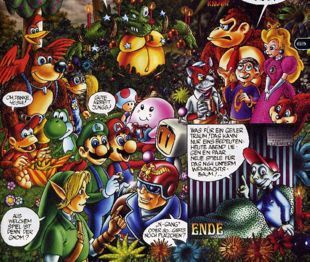 While the N-Gang series's focus lies on the teenagers constituting the N-Gang, in about half of the comics characters from the Mario series and its spin-offs appear, beginning with the fourth story "Jagdszenen aus der unteren Oberstufe." Wario, accidentally projected from a malfunctioning Game Boy Color into the Real World, was one of the main characters of "Jagdszenen aus der unteren Oberstufe," and again seen in the comic's quasi-sequel "Gecko." Mario himself also played a major role in "Das Ende der Welt?" where it was his task to fight Bowser back who was brought to Earth through one of N-Gang member VIP's experiments. The plumber was also seen in three more stories. Yoshi, again projected from a video game onto Earth by VIP, helped out N-Gang member Big B. in "Die Ostereier-Situation" by laying eggs which B. needed for his class. Yoshi appeared in three more stories, making him the most regularly-appearing N-Gang character not exclusive to the series, along with Mario. The comics "Freeze Frame" and "N-Gang vs. Nintendo" featured a lot of Mario characters, most of them playing minor roles. Banjo "Freeze Frame", "N-Gang vs. Nintendo", "Die Hexe lacht um Mitternacht"
Bowser "Das Ende der Welt?" Donkey Kong "Freeze Frame", "N-Gang vs. Nintendo", "Die Hexe lacht um Mitternacht"
King K. Rool "Freeze Frame"
Kirby "Freeze Frame", "Die Hexe lacht um Mitternacht"
Lanky Kong "N-Gang vs. Nintendo"
Link "Freeze Frame", "Die Hexe lacht um Mitternacht"
Luigi "Freeze Frame", "Die Hexe lacht um Mitternacht"
Mario "Freeze Frame", "Das Ende der Welt? ", "N-Gang vs. Nintendo", "Die Hexe lacht um Mitternacht"
Pit "Die Hexe lacht um Mitternacht"
Samus Aran "Die Hexe lacht um Mitternacht"
Wario "Jagdszenen aus der unteren Oberstufe", "Gecko"
Yoshi "Freeze Frame", "Die Ostereier-Situation", "N-Gang vs. Nintendo", "Die Hexe lacht um Mitternacht"
The comic starts out with Toni and Nick walking through their town and talking about football and Godzilla. Toni is just about to tell Nick of his game Turok II, when they suddenly see a giant Tyrannosaurus rex in the streets, terrifying the citizens. Soon Nick realizes that it is just a projection made by their friend VIP who is working on his holoprojector. The T. rex slowly vanishes, and Toni realizes that it is time to help his father to install his scanner. Nick asks him to give him his Turok game for Game Boy Color, and enthusiastically starts to play. Not watching his way, he crashes into a traffic light. Suffering from headache caused by the crash, he sees another dinosaur on the street. This time it is a Hunter from Turok, vandalizing the town by lifting a bus and smashing it, and soon it turns out that this time is not one of VIP's projections. Nick finds out that he can receive a weapon by selecting it from the menu of his Game Boy. He chooses a fire-shooting weapon, but before figuring out how to use it properly, he first accidentally burns down Wurst-Karle's hot-dog stand. The dinosaur monster tries to attack Nick, but the teenager shoots a hole in its shoulder, revealing some of its mechanical components. This, however, makes the monster even angrier, and Nick fires another shot at it, upon which it resolves into its mechanical component parts. In this moment, Nick comes to at the traffic light he crashed into, and realizes that he was dreaming. He comes to the conclusion that he should better pay attention at what is happening in front of him, instead of just the game, and finds with relieve that his Game Boy is still intact. Toni, Nick and Big B. leave the cinema, after having watched three horror films there. They talk about what it would be like to be a vampire, and B. for a moment behaves like one, dreading the light. Toni notices what seems to be a trail of blood on the ground, but Nick makes out that it is just a trail of ketchup. Following it, the friends spot its origin, three nasty looking guys eating sausages. B. recognizes them and provokes one of them by calling him names. The guy calls on B. to come closer, and when he does so, he smashes what is left of his sausage right into B. 's face. Covered with ketchup, B. angrily decides to take revenge on them, and explains that they are Robi, Pelle and Bernd, notorious bullies at school. Toni sees the three entering a church, and since this seems to contradict their general behavior, Toni, Nick and B. decide to follow them. While Nick and Toni observe the bullies filling a bottle with holy water, B. grabs a ketchup and a mayonnaise bottle from Wurst-Karle's hot-dog stand. When Robi, Pelle and Bernd come out of the church, he squeezes the content of the bottles into their faces. Nick, Toni and Big B. run away from the bullies, but soon arrive at a dead end alley. Having no other choice, they enter a door and find themselves in a dark room. When lighting a match, they find that the room is filled with coffins, one of which is opened with a man lying inside and snoring. In this moment, Robi and the others arrive in the room. Nick and his friends flee into an adjoing room, and decide to go upstairs, since they can see light and hear voices coming from there. Arriving there, they find themselves at a railing from which they can look down and see a room full of gloomy people. Nick comments it looks like the original cast of Dracula. In this moment, Robi, Pelle and Bernd enter the room below them, and Nick requests his friends to be quiet in order to not get discovered. B. however, still desiring to take avenge, grabs a bucket of ketchup and pours it out right above the bullies. Covered with ketchup, they see the man who was lying in the coffin, now groaning and staggering in their direction. Terrified, Robi, Pelle and Bernd run away, and Nick notices that Bernd dropped his bottle of holy water. He jumps down, grabs it, and squirts it in the reputed vampire's face, in order to make him disappear. However, it does not work, and the friends leave the room terrified. At the end of the comic, it turns out that the room was just a bar with the lights not working, and the reputed vampire was a drunken man who lost his dentures. Toni has to give a presentation in school. Meanwhile, Nick is playing Wario Land II on his Game Boy Color that VIP had repaired. Möller, his teacher, notices that, takes the Game Boy away and hands it over to schoolmaster Schröder. When in his office, Schröder inquisitively tries out the game. Suddenly, Wario, the protagonist of the game, turns to life and chases the schoolmaster. When seeing that, Nick conjectures that VIP is responsible for it. He enters Schröder's office, finds the Game Boy and turns it off. As expected, Wario disappears from the "real world", but so does Schröder. Both can be seen now on the Game Boy display, where Wario continues to chase Schröder. When he finally throws him out of the screen, Schröder appears in the "real world" again, sitting on his cupboard, quivering. Frightened, he calls on Nick to leave his office and to take along his Game Boy. Nick is on his way back home, annoyed at the fact that Möller took his Game Boy away and that someone also stole his bike. Suddenly he notices Robi, Pelle and Bernd behind him. They hold him down and take his wallet and Game Boy away. Gecko interferes and asks the tormentors to let Nick alone. Robi is amused about that and tries to attack her, but Gecko fights back and finally defeats them, giving Nick his Game Boy back and saying good-bye to him. Later that day, Nick visits VIP, reporting on the events in school. VIP tells him of a girl who fixes him up with tools he needs for his inventions. This girl arrives at VIP's room in this moment, and turns out to be Gecko. VIP demonstrates the power of his manipulated Game Boy Color, bringing Wario to life again. Unexpectedly however, VIP isn't able to control him through the console, but Gecko manages to throw Wario out of the window. He lands right in front of the entry door and scares Robi, Pelle and Bernd away, who had come to take revenge on Nick. VIP finally turns off the Game Boy, making Wario disappear again. The comic begins with B dreaming about himself as a superhero but this quickly ends when he is awoken by Diddy who is inside B's TV and is banging on the screen. Diddy tells B that his help is needed and Diddy pulls him into the tv screen taking him through a worm hole. They emerge in a snowy landscape where they find Yoshi too cold to help himself. After warming Yoshi up they find Bomberman and Kirby frozen solid in ice blocks. Yoshi uses his fire breath to melt the ice freeing them. They explain that King K. Rool is the one behind this evil plot. After easily destroying the ice monsters they get to the ice castle where King K. Rool is hiding out. After defeating King K. Rool they celebrate where you can find B, Mario, Luigi, Banjo, Kazooie, Donkey Kong, Fox, Diddy Kong, Conker, Peach, Yoshi, Toad, Captain Falcon, Kirby, Bomberman, and Link partying around a Christmas tree which has King K. Rool tied to it. In this comic, the N-Gang goes to a Soccer camp and while there are confronted by a team made up of Banjo, Kazooie, Wario, Yoshi, Princess Peach, Donkey Kong, and Lanky Kong, while Mario served as a referee. Toni decides to play Banjo-Tooie when one of VIP's machines brings Gruntilda to the real world. Gruntilda then turns the two into Hot Dogs and goes out into the city to reek havoc. B and Gecko eventually come to VIP's apartment room where they find the two. After B almost eats them, Toni and VIP explain what has happened. Gecko and B devise a plan and that is to use one of VIP's machines to bring Banjo into the real world. Banjo then defeats Gruntilda by throwing an egg at her. Afterwards, they all celebrate. This page was last edited on February 25, 2019, at 02:33.